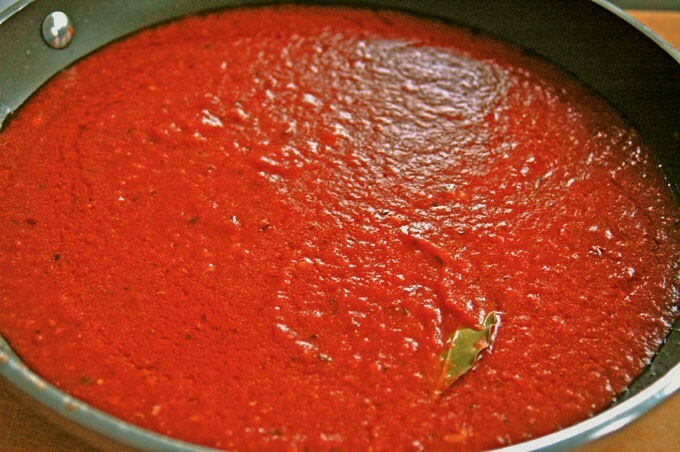 Here’s my go-to recipe for authentic, Italian, Homemade Marinara Sauce, with no added sugar! It’s so quick and easy, you can forget jarred sauce! Vegan and gluten free. 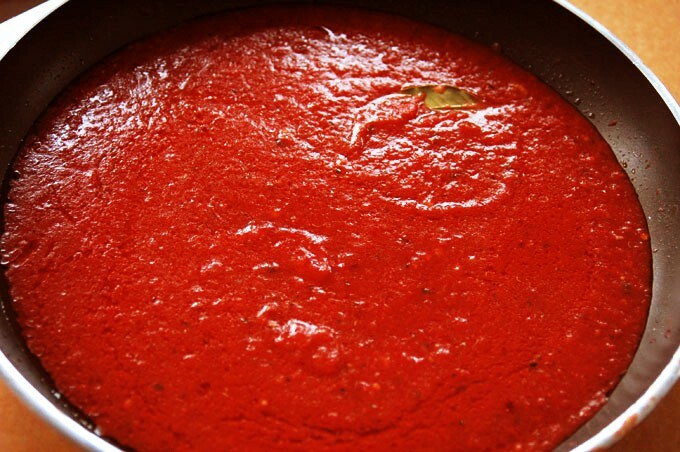 Did you know that jarred tomato sauce can contain more sugar per serving than a candy bar? A half-cup serving of Prego Traditional Pasta Sauce has 10 grams of sugar, while a fun size Snicker’s Bar has 8 grams. And who only uses half a cup of sauce? Fortunately, homemade marinara sauce happens to be one of the easiest (and most delicious) things to cook. My family calls it “quick sauce,” and it has no added sugar. I’ve been making this for decades, often in big batches so that I can keep an extra quart or two in my freezer at all times. I serve it over pasta, on pizza, mixed with spaghetti squash, and ladled over eggplant or chicken Parmigiana. As quick and easy as this sauce is, my kids’ friends always tell me it’s the best they’ve ever had. Why is that? What could be so different? I’m guessing it’s because I not only skip the sugar; I also don’t use oregano in my sauce. Neither does my family, my husband’s family, nor any of our friends from Italy. Oregano, especially dried, is just bitter. (My personal theory on why jarred tomato sauce contains so much sugar is that it needs to compensate for the oregano.) I also like to add a bay leaf for flavor. So, try making your sauce without oregano and sugar. If you buy the right canned tomatoes, you can avoid bitterness altogether. I like Tuttorosso or Cento San Marzano. If you still taste bitterness, try adding a little more olive oil (not extra-virgin — you need regular olive oil for this, since it has a more mild taste). If that doesn’t work, my Mom’s tip is to add a half teaspoon of baking soda to the sauce. 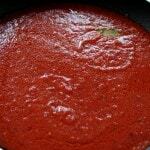 It's so easy to make Homemade Marinara Sauce! Make a big batch and freeze the extras! Heat olive oil in a large skillet (or large sauce pan if making more than one batch) on medium high. Add onion, if using, and cook until soft, around four minutes, stirring occasionally. Add garlic to pan and cook for a minute, stirring a couple of times. Add crushed tomatoes, bay leaf, salt, and pepper flakes; stir. When sauce starts to boil, lower the temperature and loosely cover the pan with a lid, using a wooden spoon resting on the rim of the pan to keep the lid propped open. Cook on low, stirring occasionally, for 20-30 minutes. Add basil leaves and stir in before serving. I often skip the onion, and the sauce is still delicious. The onion will produce a sweeter taste, so try it both ways to see what you prefer. If you are making a larger quantity of sauce, you will need to increase the cooking time. If doubling the quantity, a minimum of 30 minutes is needed for cooking. For triple and quadruple batches, cook the sauce for an hour. If making a huge batch for a party, cook it for 90 minutes. Also, you can just use one bay leaf for up to a triple batch. If you are making quadruple or more, use two bay leaves. Hi Nikki – Great! I added you to the list. You may receive a confirmation email. For an old fashion New England pizza flavor add fennel seed to the sauce. Hi Larry – Oh, that’s an interesting idea. Thanks for sharing! Hi Beverlee – I’ve just added you to my email list, but you will have to confirm your subscription when you receive the confirmation email. I hope your family enjoys my recipes! I don’t have regular olive oil, only extra virgin. Would that be ok to use? Hi Jalaine – Yes, you can use the extra-virgin. You might want to use an onion in the sauce to bring some sweetness to compensate. Enjoy! If we wanted to make it just a little less chunky, would tomato paste work instead of crushed tomatoes? Hi Katie – Crushed tomatoes in the can are not chunky, just thick. I would not substitute tomato paste, because tomato paste needs to be used in small quantities. However, if you want a thinner sauce, you could substitute tomato puree for the crushed tomatoes, then add a couple spoons of tomato paste to thicken the sauce to your liking. Hi Pam – I’m so glad you’re enjoying the recipes. I don’t want anyone to eat bad food, Lol!